Christmas in July had to be invented just for me because I need all the time I can get when it comes to making holiday gifts and decorations. This Cookie Cutter Christmas collection from Amazing Designs stitches up quick and easy on felt. It is so adorable you might want to start making them early for next year because everyone will want them! 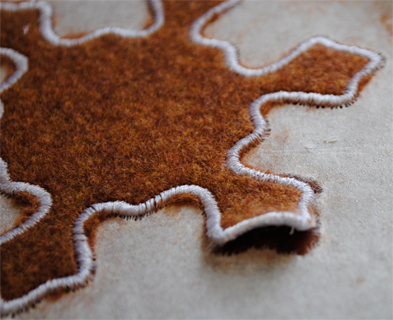 The cookies in this collection are appliques and have three file types depending upon whether you want the cookie to have a raw edge, blanket-stitched edge, or satin-stitched edge. I chose satin stitch versions. I used adhesive-backed stabilizer for this project (I would probably use water soluble the next time). Hoop the stabilizer and gently score around the inside of the hoop, then peel away the protective paper layer. 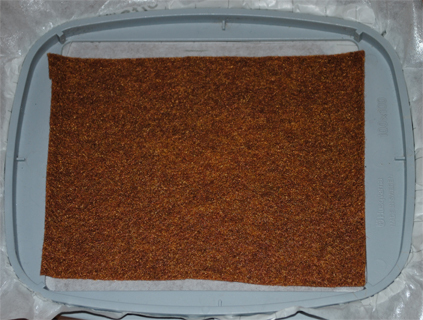 Place felt on the sticky side and finger-press it in place. If using water-soluble stabilizer in the hoop, spray the back of the felt with adhesive spray and finger-press it in place. My favorite wool felt is Marcus Brothers. It is extremely soft (70% wool and 30% nylon), but hard to find. My source? The Stash Store. The first two stitch sequences are the tack-downs. The third is the underlay and satin stitching. The fourth is the inside design or cookie decoration. Because I chose a finished edge, I clipped to the stitch line with applique scissors after the tack-down stitches and before the satin stitches. By changing thread colors, I created a couple of variations in the cookie decorations. During the satin stitching, a tear occured in the tear-away adhesive-backed stabilizer. Instead of scrapping the project, I added a piece of adhesive stabilizer to the back of the hooped stabilizer to secure the tear. Simply peel away the protective paper and finger-press the patch to the hooped stabilizer. 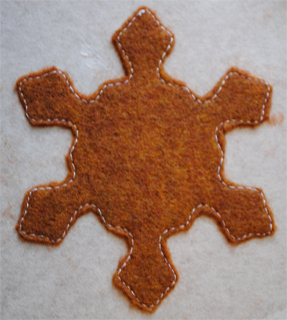 It finished stitching the snowflake detail perfectly. Tear the stabilizer away and they are ready for the plate! Cookies could also be appliqued to any item you wish: sweatshirt, towell, quilt, etc. 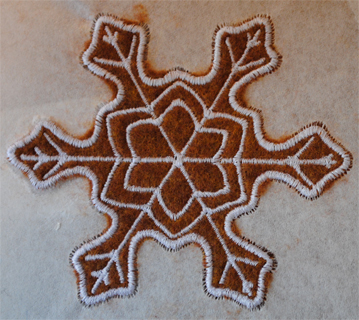 Use metallic threads for the snowflake design to add sparkle. Be sure to slow down stitching speed and use a metallic or top-stitch needle. 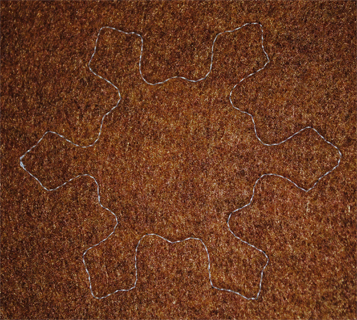 Sew or glue beads to snowflake tips. Embellish with dimensional paint for "icing" or glue tiny glass beads on the cookies as "sprinkles." Additional designs in this collection can be stitched on corners of a dinner napkin and used as a gift basket liner. 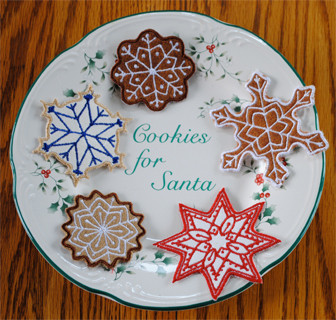 Include some stitched cookies, a mason jar of cookie mix, and a recipe. Buy decorative Christmas plates after the holidays (save 50-75 percent) and start on gifts for the next year.